This is my understanding of how it was in the mid-1960s; much of it may still apply to the small number of analogue recordings that are released on vinyl today. 1. In those days the original recordings would typically be made on 4-track tape, often with more than one instrument or vocal having to be recorded onto each track. Generally a number of takes would be recorded of each song. 2. Engineers would do mix-downs of the preferred takes into both mono and stereo. A number of mono mixes might be made of each track, and a number of stereo mixes. 3. The chosen mixes for a given album side would then be physically cut out of the mix-down reels and spliced together to make a master reel for cutting the record. Sometimes there would be a further process of copying this tape, applying compression and equalisation to facilitate the subsequent disc-cutting stage; sometimes not. With Blonde On Blonde there wasn't; the album was cut directly from the assembled masters for each side. 6. So after about 100,000 records had been pressed a new matrix would have to be cut from the master tape, and the cycle would start again. Then eventually the master tape might wear out, so a safety copy would be dug out, and they would carry on with that. Eventually, with Blonde On Blonde, even the safety copies of the stereo masters wore out, which is why the album had to be completely remixed for its release on CD. The same applied to Bringing It All Back Home. Note: much of what I've learned about this comes from Bob Irwin, who produced the mono reissue of Blonde On Blonde for Sundazed Records. See the interview at Appendix E. Collector Robert Kornovich has also been a mine of information. Then there was a dash followed by a suffix, which had two parts. First there was a number, indicating the version of the master tape it was cut from; this would change if the album was remixed or remastered for any reason. Then there was a letter, which went up one for each lacquer cut from that version of the tape. The number was stamped into the matrix, and it appears on the manufactured vinyl album in the run-out area, i.e. the space between the music grooves and the paper label. 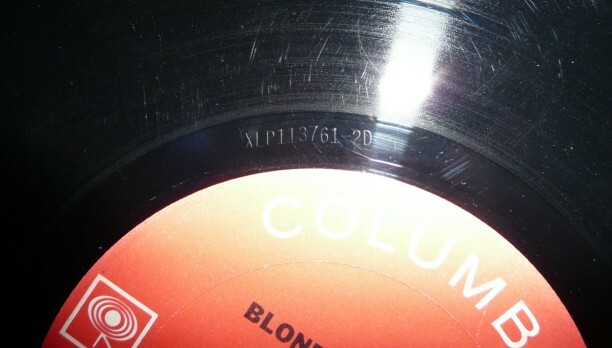 The US mono copy shown here has the matrix number XLP113761-2D, indicating that it was manufactured using the fourth matrix cut from the second version of the master tape for that side. All master tapes for Columbia's East Coast artists (including Dylan) were at that time held at their New York studios. In the mid-60s it would have been normal for the all the matrixes to be cut there too, from the first-generation tapes. (Later on, tape copies would be sent to Columbia's studios in Los Angeles or San Francisco for them to cut their own lacquers.) When a record first went into production New York would cut six lacquers for each side and send two to each of Columbia's three pressing plants - these were in in Pitman, NJ, Terre Haute, IN, and Santa Maria, CA. When a matrix needed replacing a new one would be cut with the next available letter suffix and sent out to the pressing plant that had requested it. So the usage of the matrix numbering scheme would have been consistent across all 1960s US pressings. where x can be pretty well any letter (J is the highest I've actually come across). What's significant is that it shows that Side 1 used the second version of that side's master tape, Side 2 the third version of the Side 2 master, and so on. Not all the songs on a side would have to be remixed each time; sometimes it might only have been one song. Clearly Side 3 was the one that went through the most changes. Evidence from Canadian stereo copies (see below) indicates that while Canada used a very similar matrix-numbering scheme to Columbia in the US, they apparently started their suffix-numbering for a US-recorded artist with the first master tape that they received, not the first that was created. So we can't conclude that these -1 Canadian copies necessarily used the US first-version masters of each side. However, listening to the content does strongly suggest that for the mono Blonde On Blonde this is, coincidentally, the case. Many songs are clearly in their most "raw" form here, notably "Visions Of Johanna", "I Want You", "Most Likely You Go Your Way And I'll Go Mine", "Temporary Like Achilles", "4th Time Around" and "Sad Eyed Lady Of The Lowlands". See the notes on individual songs in Part II. The French and UK mono editions are harder to pin down definitively, as CBS mastering and pressing plants in Europe didn't use the same matrix numbering scheme as in the US and Canada. However, comparison of the recordings enables us to deduce with reasonable confidence which generations of tapes were used. These are shown in Appendix C, which summarises the differences in mono mixes between different countries' editions. Sides with a -2 matrix contain what I refer to as the 'original' stereo mixes; these seem to me most likely to be the ones produced by Robbie Robertson in New York in June of that year. Later US stereo copies (from early 1968 onwards) started to introduce -3 matrix numbers for the first three sides; these were cut from the third version master tapes, containing revised mixes of many of the songs. These masters were produced in time for the Australian and New Zealand stereo releases in August 1966, but it is not known who directed the revisions. The -2 matrix number was retained for the last side of the album: "Sad Eyed Lady Of The Lowlands" never had a revised stereo mix on vinyl. During a transitional period at the end of the 1960s, quite a number of copies seem to have been pressed with different permutations of -2 and -3 matrixes for the first three sides. These accordingly had a mixture of the original and revised mixes. 1970s US pressings introduced a -4 suffix for the first three sides and -3 for the last side, but these sound identical to the versions they replaced. This shift in matrix generation appears to have coincided with Columbia's move to pressing LPs on thin, lightweight vinyl; possibly the equalisation had to be adjusted for this, and a new set of master tapes was perhaps produced for this reason. Regarding Canada, all 1960s stereo copies of the album that I have heard of so far have -1 -1 -1 -1 suffix numbers, with either A or B as the suffix letter. Sadly, though, they do not contain the missing first mixes alluded to above; they have the original US (-2) mixes. This clearly suggests that Canada started their own suffix-numbering scheme with the first tape they were sent, rather than following the US numbering. Presumably at some point Canadian production switched to the revised mixes, and probably the matrix number suffixes changed at that point, but I have no information about this. Once again, the suffix is the important part: the letter indicates the side of the album, A to D, and the number indicates the generation of the matrix; but there is a less obvious relationship between the numeric suffix and the version of the mixes used.